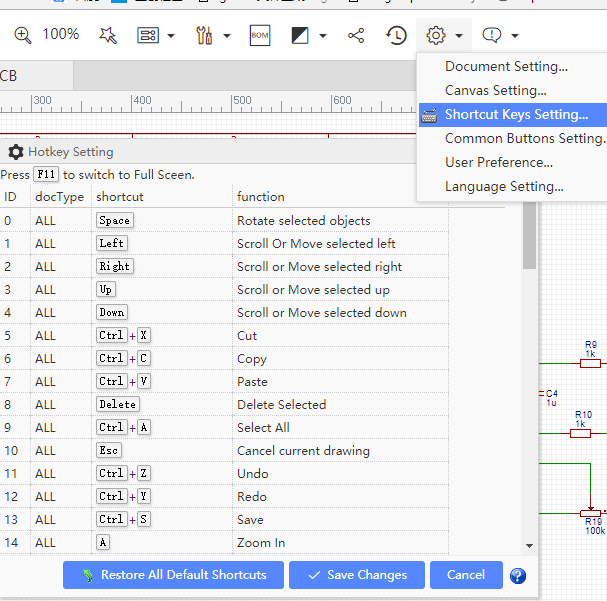 After a while of using an EDA tool suite, clicking all over the place with a mouse gets very tedious and seriously reduces your productivity. Keyboard shortcuts or Hotkeys avoid much of that. EasyEDA not only provides lots of hotkeys, but also every hotkey can be reconfigured. Under the Config toolbar, click the Hotkeys Setting… Menu which will open the Hotkey Setting dialog. To change a Hotkey, click anywhere in the row for the hotkey you want to change and then press your new key. For example, if you want to use R instead of space to rotate selected objects, click on the first row, then press R.
After you change the hotkey, don’t forget to click Save Changes button. ALL: any document type in EasyEDA. PCB: PCB and PCB libs. The functions of some hotkeys may change between docTypes. For example, the hotkey C draws an Arc in SCH, but draws a circle in PCB. A list of all the available default hotkeys is given below.